In a society that is still “me, me, me” based sometimes it might be difficult to think that we can really learn to live with less. But is it possible? Of course it is. Now, I’m not suggesting that you just give up everything you own until you’re left with the basic necessities to get by. But, you could at least consider giving up a little bit. In fact, it could go a long way when it comes to raising kids to not have an entitlement mindset. While I’m not suggesting that you go full on minimalist, it couldn’t hurt to start evaluating what you have. #1 Practice gratitude. Gratitude is a powerful emotion that fills our souls with an appreciation for the little things in life. Every breath, cracker, smile and ray of sunshine fills us with more vitality and life than a new car, a diamond ring or designer handbag. To begin to learn to live with less, spend some time each and every day writing down or at least contemplating what you’re grateful for. Chances your daily list will be full of the smaller, life-giving joys and simple pleasures rather than large material items. One way to do this is by keeping a gratitude journal. It doesn’t have to be anything complicated, just write down three things that you’re grateful for every day. 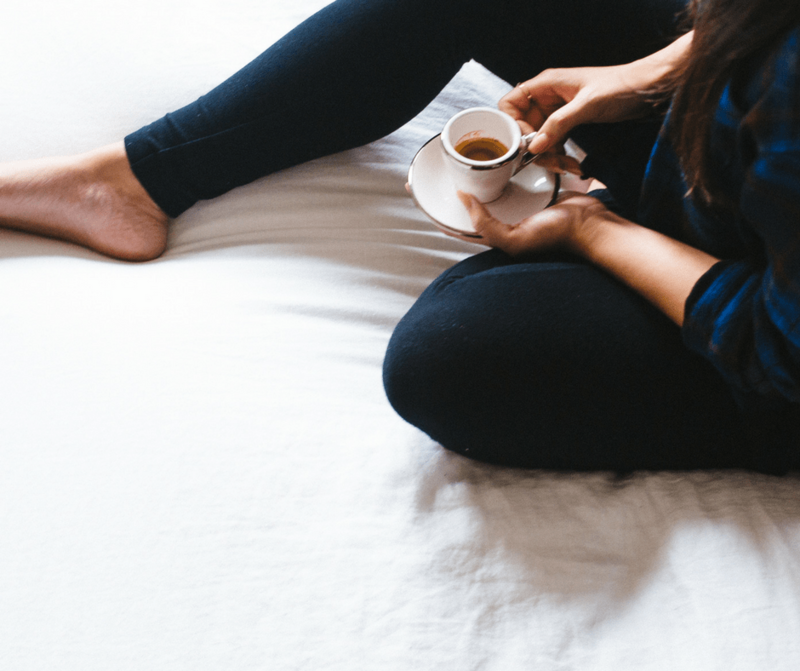 The trick is to do this first thing in the morning instead of at the end of the day. #2 Give back. When we see people around us that have so much less than we do, it puts things into perspective. However, it’s very easy to not see these people. Seek them out by giving back to your community. Find people who need food, shelter, and clothing – the basics. Give them what you have to give even if it isn’t much – every little bit helps. Just going through your closet and donating items that you haven’t worn in a long time can put clothes on a child’s back or dress a person so they can interview for a job. Volunteering in your local community, be it at a school, homeless shelter or local Salvation Army is a great way to see what’s really going on. My mom and I volunteered for the Salvation Army food truck and that experience will stick with me for the rest of my life. #3 Use the 30-day rule. When you’re contemplating a purchase, give it thirty days to think it over. Many times, you’ll realize you can live without it quite happily. Our tendency and habit to shop impulsively often fills our homes with items we really don’t need. Forcing yourself to stop shopping impulsively and to shop consciously is a huge change for many and a great life lesson. If you have to justify a purchase- it may just be your inner voice telling you that you don’t need it. #4 Create a budget. You’d be surprised how many families and individuals have no idea how much money they spend each month. This means your money is controlling you and it results in stress at the end of the month when the bills are due and your bank account is empty. Creating a budget is the first step to learning to live with less, because you ultimately know exactly how much you have to spend. It puts you in control of your money. Creating a budget doesn’t have to be a burden! A budget can actually be quite liberating unless you think that a budget isn’t necessary. #5 Create financial goals. 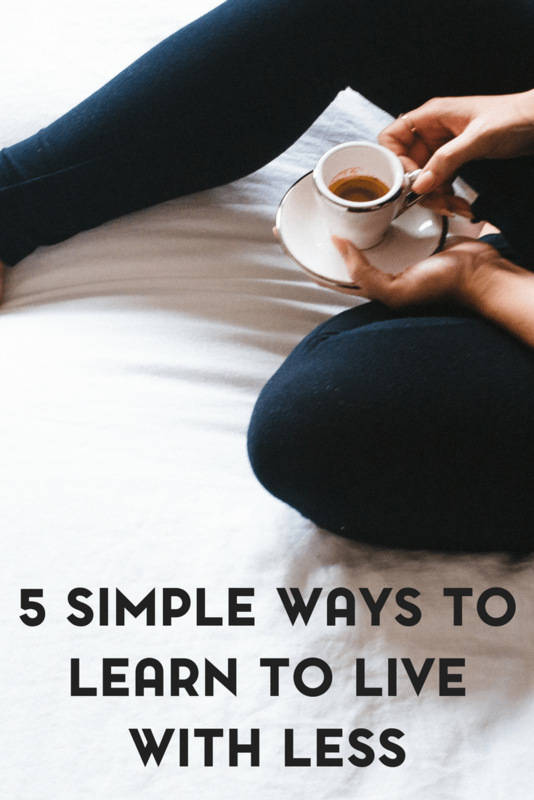 One excellent way to learn to live with less is to create financial goals. This changes your priorities from spending to saving. It doesn’t matter what you’re saving for, be it college, retirement, a vacation, a new car, an emergency fund – creating financial goals is essential to changing your mindset from a spending one to a saving one. This goes hand in hand with creating a budget. Another way to do this is by creating a vision board with visual reminders of things that you’d like to obtain. Of course, creating goals is only the first step; you also have to create a plan to achieve them. This requires a budget, and you need some system to track your success. 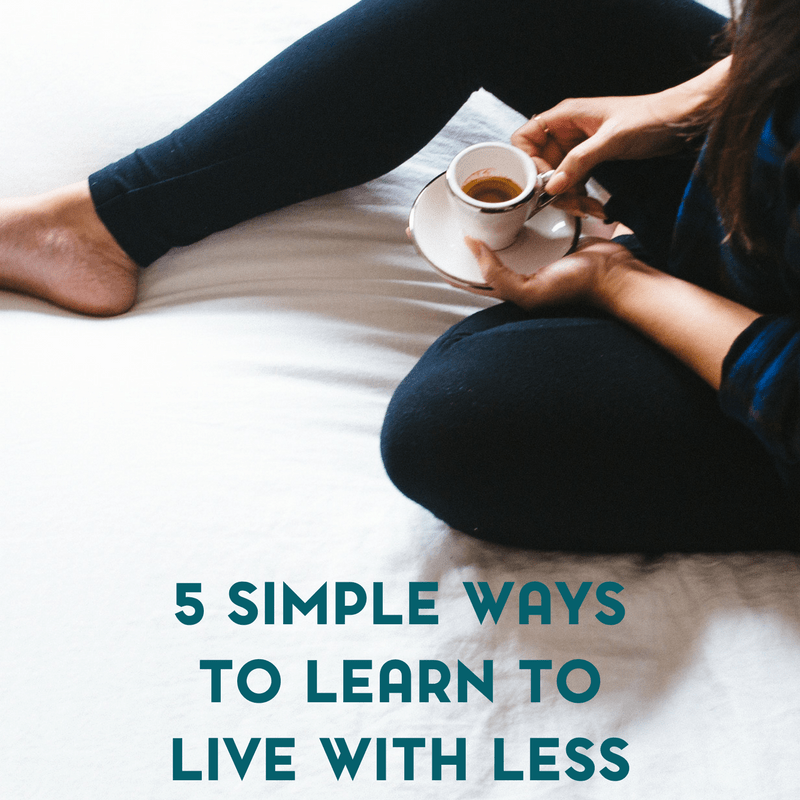 Learning to live with less is about changing your mindset. 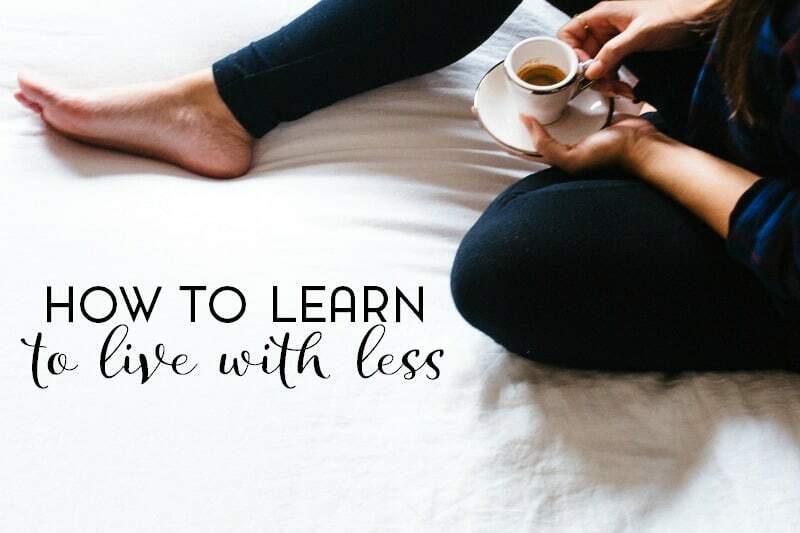 When you change your goals, control your money and appreciate the small things, living with less becomes an enjoyable, empowering and energizing process. I love that you have the experience of volunteering for the Salvation Army. I volunteered for them years ago and I still remember how good it felt to help too. And how nice everyone was, esp. those getting help! Those are great tips. I am learning this as I type. It’s hard to save with 4 children but we do cut down more now then before. I love this article. The gratitude journal is something that I would love to do. This is what I always tell my kids, to be thankful of what we have., Even though we don’t have a lot of material things that other people have, we have t what is the most important, the love of our family. Kori, you are one amazing Christian lady with wonderful values and love sharing your blessings.